To burgle, or to rob, burglarize, loot, steal from, plunder, and pillage — All very scary words that we don’t enjoy thinking about as a verb to apply to ourselves. We take extreme measures to deter burglaries from happening. Buying a dog, putting a pair of muddy boots out the front door, having a bat next to the bed, and owning guns are all things that people do to guard from a person making the decision to rob your house out of all the other houses. These cautionary steps were not enough for me; being robbed was my biggest fear as a child. I would lie in bed terrified that someone would break through my seemingly easy to smash window. I dreamed for a house that had a steal bulletproof, fireproof, and nuclear war proof shell that went up at night when I went to bed. That would have given me much more sleep at night. Instead, I just got FOX news blaring through my door reminding me of the terrors in the world. Today’s infographic must be viewed in two steps. 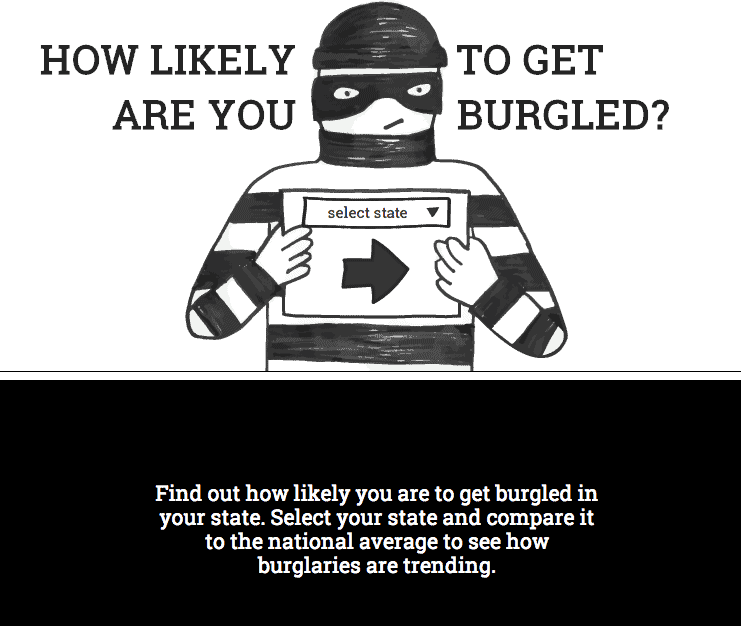 Follow the “[via]” link to the main site, select your state of residents and see how likely you are to get burgled, or robed, burglarized, looted, stolen from, plundered, and pillaged.